This folio comes from a volume containing Matthew Paris's 'Lives of the Offas' and 'Deeds of the Abbots of St Albans', written by him at the Abbey of St Albans sometime between 1250 and 1254. The Latin inscription at the top translates: "This is the work of Brother William of the Order of Minors, companion of St Francis, second in that Order, holy in conversation, English by birth." 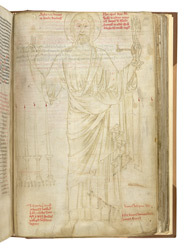 The drawing dates from c.1224 with later inking-over added in the mid-13th century. Find out more about this item, and other illuminated manuscripts in our Expressions of Faith Virtual Exhibition.